It was David Warner and Jonny Bairstow that denied the Kolkata Knight Riders a victory at the Rajiv Gandhi International Stadium in Hyderabad. The Kolkata Knight Riders put u a total of 159 runs on the board. Little did they know that Warner and Bairstow would deny them victory by stitching 131 runs on the board and instead hand them with their fifth defeat of IPL 2019. David Warner remained the highest scorer in the IPL and thus clinched a comprehensive victory by 9 wickets and five overs to spare. With this SRH stands on number four of the IPL 2019 points table and KKR is now on number six. IPL 2019 Live Streaming & Live Cricket Score on Hotstar and Star Sports: Watch Free Telecast of Indian Premier League T20 on TV and Online. 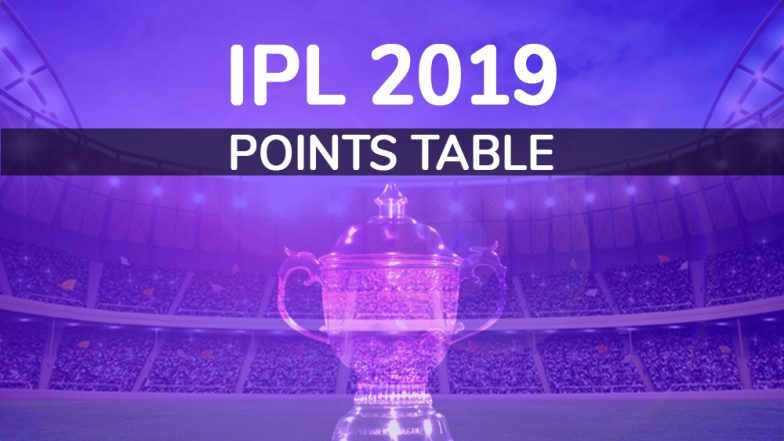 You can check out the complete and updated IPL points table involving eight teams - Chennai Super Kings, Royal Challengers Bangalore, Rajasthan Royals, Kings XI Punjab, Delhi Capitals (formerly known as Delhi Daredevils), Kolkata Knight Riders, Sunrisers Hyderabad, and Kings XI Punjab are the franchises taking part in the IPL 2019. Out of these eight teams, only four will advance to IPL 2019 playoffs. IPL 2019 Schedule in PDF: Download VIVO Indian Premier League 12 Full Timetable With Fixtures, Matches, Team and Venue Details. VIVO Indian Premier League 2019 kicked off on March 23 with MS Dhoni-led Chennai Super Kings taking on Virat Kohli's Royal Challengers Bangalore (RCB). It was an easy seven-wicket victory for CSK at MA Chidambaram Stadium. Chennai continued their winning momentum against Delhi Capitals (DC). By winning two out of two matches, Dhoni & Co. have collected four points. However, Kolkata surpassed them on March 27 to take place on the leaderboard. They defeated Punjab side convincingly to also remain unbeaten in the current edition so far. The IPL 2019 is based on a double round-robin format, which means a team will play 14 matches in the first round on home and away basis. For each IPL team, there will be seven home and seven away games. After the completion of the league stage, top four teams on the IPL 2019 points table will advance to playoffs. After the Qualifiers and Eliminator, two teams will contest the final of IPL 2019, which will be held on May 12. Just like previous seasons. two points will be awarded to the winner of a match. If there is a tie match, the team which wins the Super Over will claim the two valuable points. If there is no result then the two teams will share a point each. At the end of the round-robin stage, if teams are tied on points then the side with better run-rate will qualify for playoffs. Chennai Super Kings are the defending champions. CSK along with Mumbai Indians have won three titles each, most in IPL’s history. Last season, Super Kings, Sunrisers, Knight Riders and Royal qualified for last four. CSK eventually won the tournament by defeating SRH in the final.